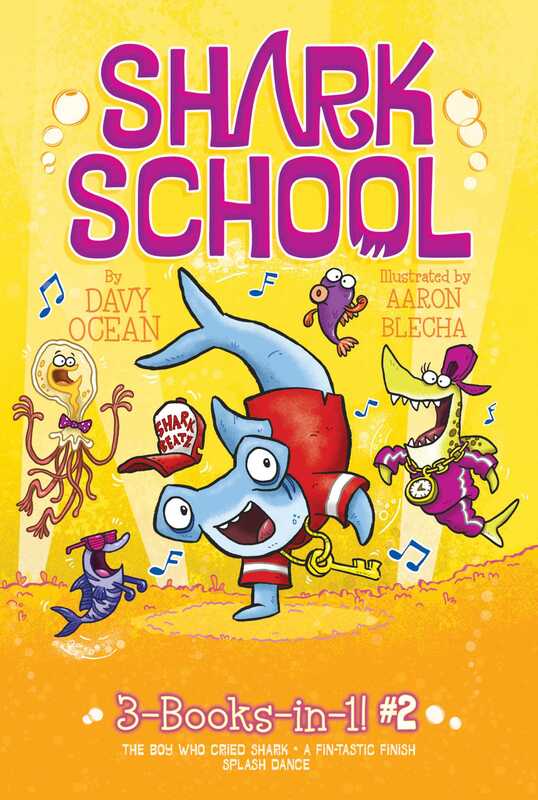 Books four through six of the Shark School series are now available in a fin-tastic paperback edition! In The Boy Who Cried Shark, Harry Hammer sees a great white shark near Shark Point, and he sounds the alarm! Turns out it’s just an old basking shark and now everyone is furious. After a couple of more minnow-sized mistakes, Harry sees a REAL great white…and it’s hungry. Will anyone believe him this time? In A Fin-tastic Finish, Harry Hammer has a new hero: Turbo Tex, a gold-medal-winning tiger shark. Maybe Harry can be just like him at Shark Point Scout Camp. Tony, another tiger shark, joins the group just in time for their annual sports camp, but he doesn’t seem to want to be friends. Can Harry change Tony’s mind and make his sporting dreams come true at the same time? And in Splash Dance, there’s a dance competition with a super-cool Fintendo DS game system up for grabs! Harry’s got his eye on the prize, but he needs someone to help him with his moves…especially when his number one enemy Rick Reef is in the contest. Can Harry beat the competition and win the award?